Forget to buy books, because we have books, right? Which leaves me repeatedly 'reading' a dribbled-on wordless buggy book "That's Not My... [insert animal, object, final scrap of sanity, here]"
Go into a real bona fide bookshop feeling like Mary flipping Poppins, expect cartoon bluebirds to land on my shoulders. Leave precisely 5 seconds later once child has over turned a huge book display and everything is basically on fire. So, when I heard about this book club it really did tick all the boxes: new books turning up monthly, returning books once we've finished with them, reusable packaging, and best of all zero effort from yours truly. I can just put his age, likes, dislikes and books he's read into the system and then forget about it, because they choose the books for you. Pretty awesome! Before we even get to the books, there's a bookmark to colour, a 'newspaper' with stories about the Land of the Bookabees, a craft activity - a cheeky monkey mask to colour in and wear that ACTUALLY CAME WITH THE STRING (my heart sank when I first saw it, I threw away all the string when he started crawling and the whole house was apparently a maze of death) And best of all STICKERS. I don't know about you, but in my house stickers are actual currency. All of this came along with three books that we have really loved. 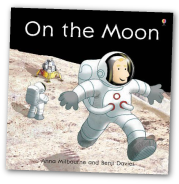 On The Moon has opened up a whole new world of imagination, until we read this Bill was a big Moon fan but hadn't ever come across the idea that it was more than a blob in the sky (Adorable mispronunciation of "croissant moon" as opposed to crescent is still encouraged) This isn't so much a story as a set of simple, well thought out facts and illustrations about astronauts and the moon. It's been a huge hit. 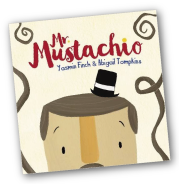 Mr Mustachio has also been a win. Essentially the story of a Shoreditch hipster who loses his facial tackle, then replaces it with found objects. It has counting woven into the story, but it's the illustrations that have been a big selling point too. Really fun, even on the 10,000th read. 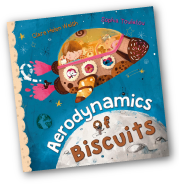 We haven't got to the Aerodynamics of Biscuits yet, but then we have 6 more weeks to play with the books before we send them back, and in that time we will have had another delivery of new books! Oh and when you send them back (included in the subscription) you can just use the packaging the last set of books came in. Sometimes, I've believed as many as six impossible things before breakfast.